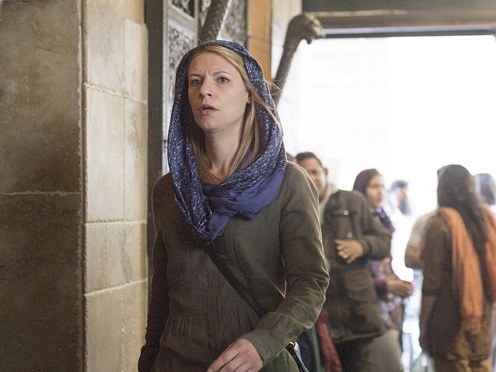 An addiction to action and an aversion to motherhood make CIA operative Carrie Mathison a sad, solitary player at the start of Homeland’s Season 4. Showtime’s most-honored series reloads with back-to-back hours on Sunday, Oct. 5th (8 to 10 p.m. central). And after a somewhat plodding start in its first season without Damian Lewis’ deceased Nicholas Brody, Homeland begins to find its way again while Carrie (Claire Danes) fixates as only she can. Without detailing too much, let’s at least divulge this. Initially assigned to Istanbul, where dependents are allowed, Carrie has arranged a transfer to Afghanistan for two principal reasons. War zones have more action and intrigue. But equally important to her is an opportunity to divest herself of baby daughter Frannie, who’s left stateside in the care of Carrie’s increasingly resentful sister, Maggie (Amy Hargreaves), and a part-time nanny. This amounts to an emotional rescue for Carrie, who’s drinking hard again while being celebrated as “The Drone Queen” by her co-workers. But when a terrorist hit goes very bad, she’s plunged into the thick of an international debacle along with Islamabad, Pakistan CIA station head Sandy Bachman (guest star Corey Stoll). Holdover Homeland character Peter Quinn (Rupert Friend), equipped with a moral compass that Carrie lacks, also finds himself ensnared. Back home in Washington, D.C., her former mentor, Saul Berenson (Mandy Patinkin), has gone to the private sector while the CIA’s diabolical new director, Andrew Lockhart (Tracy Letts), fumes and covers his tracks. Homeland, whose fourth season will have 12 episodes, has never re-achieved the highs of Season 1. But its downward slide shows signs of leveling off by the end of Sunday’s opening two hours. Danes’ Carrie is steelier than ever, her heart hardened to near-concrete while going about the exhilarating business of eliminating terrorists no matter what the collateral damage. Carrie retains residual feelings for Brody, but there are no flashbacks to their time together. He’s Frannie’s father but that’s not a tie that binds her. She’s barely capable of being a mother for a day. See Episode 2 for conclusive evidence of that. Episode 1 ends with a chilling action sequence that for a time threatens to keep Carrie on the CIA’s bench. Quinn is left dazed and demoralized while she plots a return to action that again will free her from any possibility of diaper-changing and bottle-feeding. Homeland is no longer a person-to-person love story. Carrie only has eyes for the next covert operation, throwing herself into the task with a ferocious determination to outwit, outplay and outlast all who would deter her. It’s called being a survivor -- strictly on her terms.